I thought there was much discussion going on about the depiction of slums in Slumdog Millionaire. I was wrong. There is much more than that. Much more than what is necessary. I spent the whole evening reading blogs of people in the US about the film. Blogs because I wanted to know what the audience thought about the film and not the critics. US because it looks like USA is being pulled into every other argument nowadays (including the British film Slumdog Millionaire). And almost everyone mentioned how they loved the film because it shows true love and not because of the slums. Well, all I can tell you that the love story wouldn’t have been loved if there were no slums in the film. 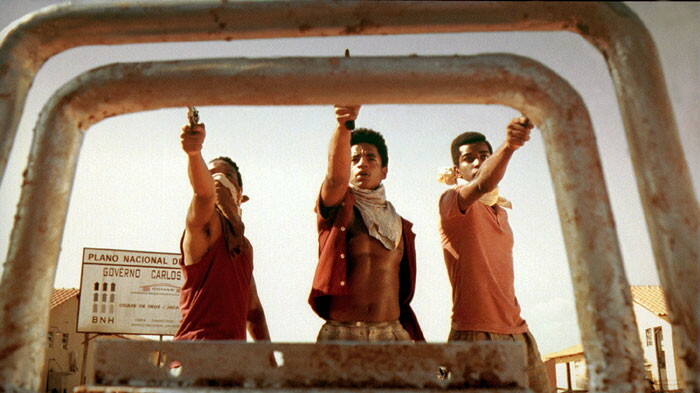 I adore City of God (2002). I can of course exhibit escapism and say that I loved it because of the narrative slickness and how well it was shot and so on. But the reality is obviously far from that. I loved it because of its violence. Because of its incessantly shocking images. Because of the sheer hopelessness it provides us. Hold on, before you label me as a sadistic psychopath, I’ll clarify my intentions. Poverty, violence and misery are things that instantly repel us in real life but interestingly fascinate us when we see it in cinema. Why? Because of the security of course. These are things that both tantalize us and drive us away. Call it guilty pleasure. One wants to be in it all, soak in it and get high in a strange sense. At the same time, snap out of it when it hurts his/her personal interests. The solution? Cinema. Rolling on the floor laughing? Yes, because we have been here, done that and know it isn’t so at all. Now, in the same vein, if I had been a resident of Rio, I’ll probably be cursing Meirelles and the fans of City of God for assuaging their lowly needs by harnessing what isn’t true at all. Take the case of our own films like Page 3 (2005) or Fashion (2008). I’m sure a large part of the Indian audience felt that that was all there is in the respective industries. But the people who are actually in these industries would be infuriated by the unwarranted sensationalism that Bhandarkar has capitalized upon. Any claims of the film’s firm footing on reality would be repudiated by them, naturally. However, these stereotypical situations that the film shows us do happen in those industries (or they wouldn’t have made it into the film at all). Sure, these are issues that plague the film and fashion world. But in no way, does it provide a clear picture of the industry. There is an inherent laziness in the audience and critics about films that are “about” something. There is so much to see in this world and it is only wise to spend a minuscule time to each of them. As a result, we accept whatever thrown at us that is about something totally arcane to us as reality. We settle into a comfortable position and mould the ideas we see into easy stereotypes for future use. This is not just the case of the west and Slumdog Millionaire. This is the general tendency for all of us, isn’t it? I still have one dimensional ideas about the politics of Poland or the situation in Africa. Heck, what do we all think of the holocaust? Do we even bother to think about what were the other facets of it? Is that a mistake? May be. But may be not. There is no obligation for one to delve into everything and know actually what is really happening out there. This particularly is true when it comes to escapist cinema. And like Page 3 and Fashion, Slumdog does not completely betray reality. It does present images that are true and are really happening out there. Note the word “images”. Images that are consequences of momentary gazes. Images that present too shallow a depiction of reality to be taken seriously. Anything that is deeply rooted in reality can be only by a person who has been so personally affected by it that it becomes a part of his thought process (a la The 400 Blows). So, even if Boyle was deeply affected by what he saw, he cannot do justice to it so soon. Hence, what he presents here is nothing but images that have fascinated him. Images that he knows that would instantly attract the audience. Images that he uses to present his Bollywood-like love story. Yes, he just “uses” these images. No claims of depiction of reality can be made here, for the focus of the film isn’t that at all (even if he intended to). Now you may ask what’s with the cheesy title of the post? I want to know if anyone found it as defamatory act that slanders Mr. Bachchan or Mr. Fincher. Of course not, everyone knows its plain silly. One that acts as a marriage of two worlds to produce a laughable (hopefully enjoyable!) effect. And this isn’t far from what Mr. Boyle has done. And I feel nothing especially wrong in that. The same is the case with films like Borat (2006). It might have been outrageous in Kazakhstan. But the Americans found it clearly funny as they found something that appealed to them (namely the East’s view of the US and their own laughable facets). Where Borat was unanimously deemed as a film intended just for harmless fun, Slumdog is being slammed despite it being one. Now, I do hear that the film is appealing to the occidental audience because India is at the focal point of world economy. And that Slumdog is essentially a pacifier for the west to not get worked up on the country’s development. Mr. Bhaskaran says that this (misery, poverty) is what the west wants to see of India. I don’t know about the workings of the western mind, but I’m sure this is the case for all of us. I mean, how many times have we laughed at the mockery of the Chinese accent? How many times have we cringed at the epidemics of Africa and felt sympathy for it? Hell, how comfortable we have been whenever we call the western countries racially intolerant? So is this all that we want to see of the west? But well, these are issues about the darker side of the human psyche itself that we never want to delve into (our own “underbelly” if you please!). And to close the circle, I comeback to the omnipotent opening quote. Everything that is there to Slumdog Millionaire, and to escapist entertainment in general, is summed up here. 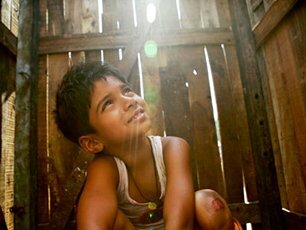 To use a oft-used cliché, Slumdog Millionaire is a mess. And what a glorious mess it is! hey.. come on.. don’t head from Godard to indulging Bachan..
Er. I never thought about Godard I guess. If you are referring to the Bazin quote, I feel that is universal and not restricted by geography at all. Bachchan in a figure as associated with Bollywood as slums are to India (if you get what I mean). Nice review and a better post to follow it up!! I too find the ludicrous abuses hurled against the movie by Indian critics and viewers both laughable and sad. Laughable because they are surely scoffed that a ‘Westerner’ has managed in portraying in such graphic detail the dark underbelly of Mumbai that very few filmmakers from Bollywood have even attempted doing, leave alone succeeding. Sad because they feel just because India is slowly and surely becoming a major global player, that automatically means India is ‘shining’ at all social and economic strata. A good artist must have the guts to depict reality, even if that means at the stake of infuriating purists. Poverty, beggary, prostitution, slums and underworld exists in India, and that is a fact. And art mustn’t just celebrate the good things of a society, but also delve into the darker aspects as well. Unfortunately in India people want cinema to promote India as the greatest place there ever was. And that is escapism at its worst. I say India because, having viewed movies from around the world, I’ve come across, as I’m sure you too have, that have pointed fingers and have made extremely painful jabs at aspects ranging from social to political to personal, and they have all been accepted by the critics there. A movie like American Beauty, Waltz With Basher, California Dreamin’, etc. are heaped with praises in their respective countries despite being sharp and cringe-inducing critiques of the darker aspects those countries. When a similar movie is made in India, they instantly attract rebuke and aggression. Deepa Mehta faced so much trouble while making Water even though we all know that the contents, however heinous might their nature be, is a well documented fact. Consequently, it is absolutely futile to bury it the bad apple and live happily ever after. The director of Walts With Basher made a wonderful and extremely thought-provoking statement that I’m not going to forget anytime soon. He rhetorically said something like, “When we decide to forget our past, where do all the memories go?”. I guess that sums up what I mean. Oh Water. I guess it was unfair. Water played it quite safe taking just a specific case and with almost complete detachment from any statements. But still it got slammed. I feel if SM had been made by an Indian, it would have been left alone without much consideration.